do hidden wiring in an apartment with his hands. When decorating work with concrete, foam concrete, brick or plaster walls various mortars, concealed wiring first stretch in the furrows, Stroebe, specifically prodalblivayut, and then close superposition raw plaster layer. Cables and wires, with double insulation, easier to lay in Stroebe, without using any additional protection. An important disadvantage of this method is that, the wires in the future it will be impossible to replace, without resorting to a violation of the integrity of the wall. Electrical wiring, which is formed in cable channels and pipes made of materials, resistant to burning, does not have such a lack of, however, this method is more time-consuming. Installation flush in the apartment begins with a markup, immediately after the rough finish. 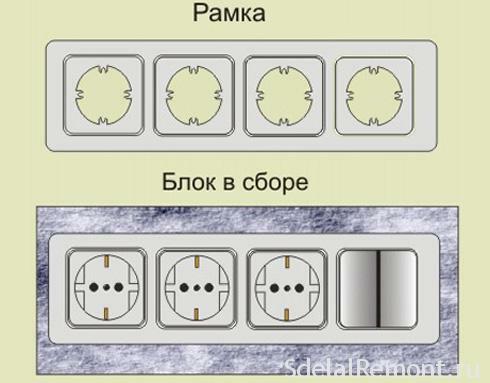 In this case, on the walls or ceilings indicated the location of the future switches, junction boxes (using them), outlets and lines, which will be held shtroblenie. Further, to mount Enclosures, you need to drill the recesses. Enclosures mounted in a recess, which are pre-filled partially with a mixture of the construction, having inherently gypsum, flush with the wall surface. The next necessary step, which will help make the hidden wiring under the plaster - shtroblenie to the desired width and depth of the previously mentioned lines. Ideally Stroebe width should coincide with the width of the stacking cable. Then once the cable firmly "held" in Stroebe, Nor did he bulged and falls. To put a single flat three-wire cable VVG, which has a cross section up to 4 mm2, usually enough Stroebe, depth in 0,7-1 cm. It is forbidden to Stroebe bearing concrete walls. 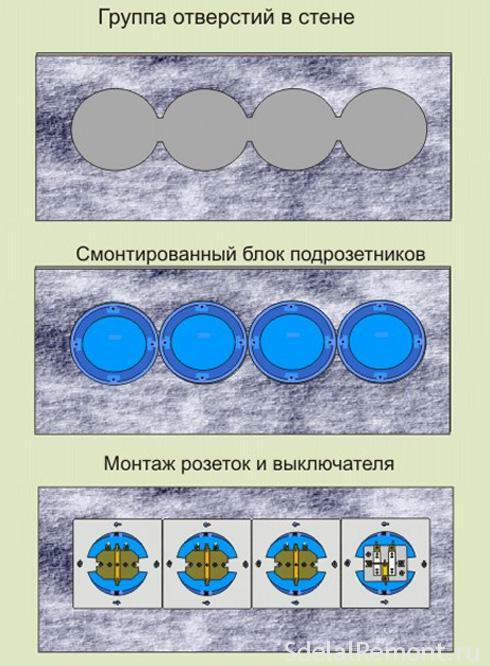 therefore, to carry out similar communication, must have sufficient thickness plaster layer for roughing work. To install Enclosures, you need to drill a wall puncher, using a special attachment - "crown". Nozzle crown to create holes for Enclosures. 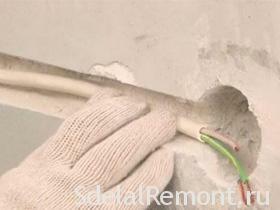 For drilling of concrete walls is better to use a punch with increased capacity, ie. over 1000 W, but, having no professional equipment for such purposes can be applied to an ordinary household hammer. In this case, you will alternate between the tool change. Initially used crown. 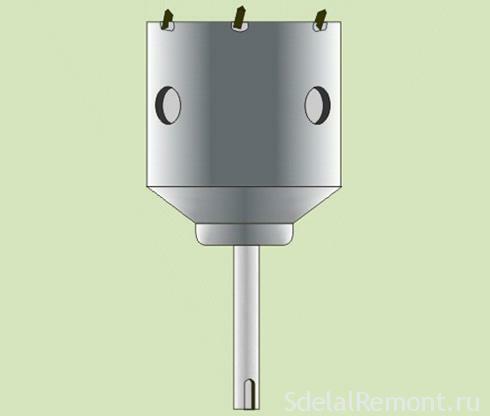 After deepening crowns 2-3 mm from the surface of the concrete (maximum power punch, used in everyday, usually not enough), it gives way to drill, having a diameter 6 mm. This drill several holes are drilled all over the groove, resulting from the use of crown. The distance between these holes should be minimal, fully closing the circle. Drilling depth drill - 2-3 cm. After that set the crown again, which already can delve longer. In this way, the process is repeated, until you reach the required depth for installation Escutcheon. Then, using a punch, concrete punctured in the center, and in the hole is mounted Escutcheon. Often, the drilling process is complicated by the presence in the concrete at the drilling site, steel reinforcement. So that, better pre probe zone, which will be subject to drilling, using portable metal detector. If you plan to conduct further wiring in cable channels and pipes, then the next step is to install them in the already prodolblennye Stroebe toward mounted Enclosures. Then routed cables and wires. The cable channels and pipes the wires and cables are tightened flexible steel wire. When the wiring without tubes and wires and cables, cable channels can be fixed directly to Stroebe alabaster (pure gypsum). The ends of the wires, are appropriate to Enclosures, tucked into them, and the excess is cut to length from 10 to 15 cm. Shtroblenie walls under the wiring is completed, now we go to the next step. Sockets often assembled into one frame units. This makes it possible to combine in one unit, not only the electrical outlets, and TV, telephone, Internet outlets and even switches. This will allow the conveniently exploit them, save space and aesthetically win. To mount this unit special latches need, namely, cable channels. Their use allows to combine together Escutcheon group follows. Next, the resulting group is set to already prepared recess. In this case, the holes should be drilled in one row and almost dense (the distance between the holes should be less than 1 mm), and the central partition carefully removed. 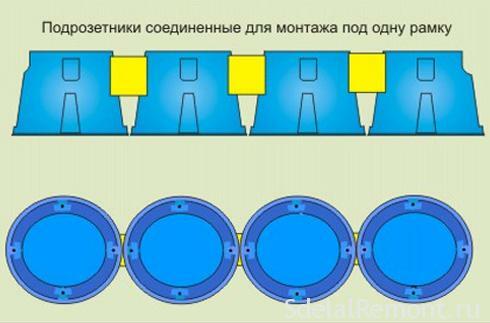 This ensures, that the unit can not disassemble, and set the whole. When installing and connecting, and after, metal frames outlets must touch tightly enough. Shtroblenie walls for guiding his hands, installation of sockets and switches. Frame and cover are installed at the final stage of finishing works, when they pasted wallpaper, a painted wall. When qualitatively work performed and the scope of the cover adjacent to the wall sockets exactly, without forming any gaps. Mounting frames and final form rosettes. To install the switchboard flush is necessary to make shtroblenie rectangular recess with a sufficient depth, width and height. With gypsum mortar in the resulting recess is fixed shield body. In this installation of hidden wiring is completed, proceed to the final stage. This step is performed based on the number of active groups. So, Each group has its own machine (OUZO), to which they are connected. In addition to output a unipolar machine must have a common, as well as the opening two-pole (single-phase circuit). At one pole is connected phase, on the other - the neutral conductor input cable. EXAMPLE switchboard installation into three groups with one spare. View switchboard on 3 group with a backup. Having a common distribution board on the landing, which includes all the metering devices (electricity meters), you can make a connection to a group of machines, the power of which is allocated to a specific apartment. If you need to ground, the grounding niche (which is part of the shield) is connected to the grounding neutral conductor, effluent from the opening of the supply cable - the so-called, three-wire single-phase system. If such a cable is not, and a work neutral wire, it is possible to connect the ground bus to him at the entrance to the opening machine. To zero the output induction machine is connected as a zero common bus, which in turn is part of the shield. Ability to disable automatic opening facilitates safe working inside the shield, for example, replacing output machines, at their exit from the system. 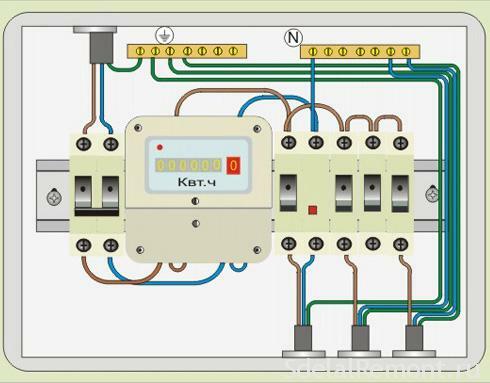 Installation of metering devices (electric meter) It is carried out before the output automaton, and after opening. On this choice and the general switchboard installation is completed. Now you know, How can we make the installation of hidden wiring under plaster, perform shtroblenie walls for guiding his hands, and install and connect the socket and a switch in the right place. Especially for site Repair one-bedroom apartment with his hands.